A temporary working surface for home and commercial use. Large working surface 30" x 48"
Just grip the handle and pull the appliance out of the way for service. 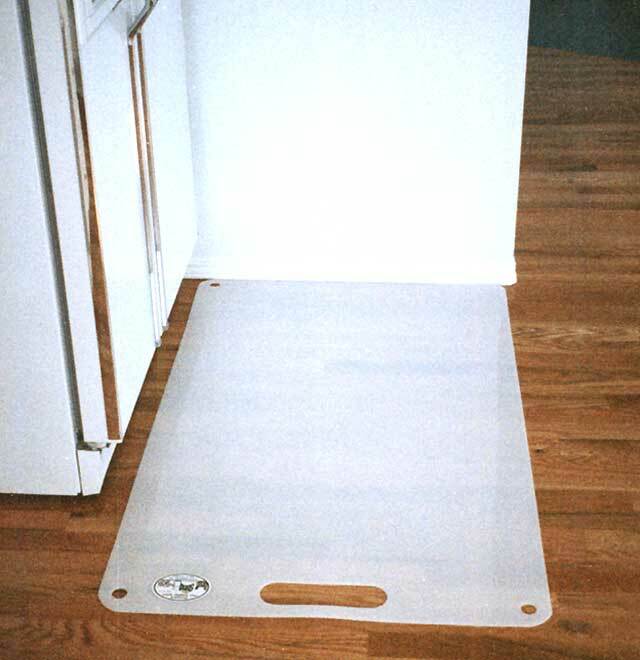 When a refrigerator, stove, washer or dryer needs to be moved around for installation, service or repair, you need Scuff Shields. "If you don't get a Scuff Shield for each of your trucks, you're either uninformed or stupid. They're cheap, and unbelievably effective. I used to endure the agony of dealing with scratched or torn floors almost regularly. Once I put Scuff Shields on each truck, the problem ended. And, I suffered fewer tech-down days because of strained backs. And better work was done because techs were less reluctant to pull out a machine for work or mere checks that needed to be done from the rear. You can't beat 'em, and you won't believe how well they work. Roll a huge side-by-side, fully loaded, out onto one, then slide it easily all around the whole kitchen, one-handed, with no problem. It seems almost like magic!" "My installers and delivery people have been using Scuff Shields for eight years. The one time we didn't, it cost us $700 to replace the floor in a one-week-old home. Our policy states that it is mandatory that every installation and delivery person use a Scuff Shield. I like the handle it makes it easier to move the appliance. 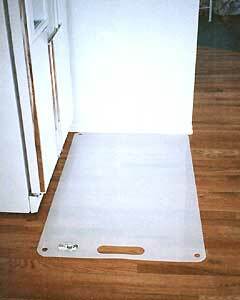 The Scuff Shield is thin enough to put a dishwasher on it  even with a raised floor  and thick enough to not destroy a floor. I believe in this product. Every professional appliance company needs to have this."